Many have been the studies and histories of sundry learned Pigs, published over the course of 200 years and easily filling several shelves. But only one of these, curiously enough, actually offers instruction on how to raise such a pig one's self. I must emphasize at the outset that I do not myself recommend such a method -- in fact, I object to it in the strongest terms! -- but in the interests of Science, this account, penned by one William Frederick Pinchbeck, contains many points of interest, and gives us something of an idea of how Mr. Bisset, Toby's first trainer, might have approached the matter. 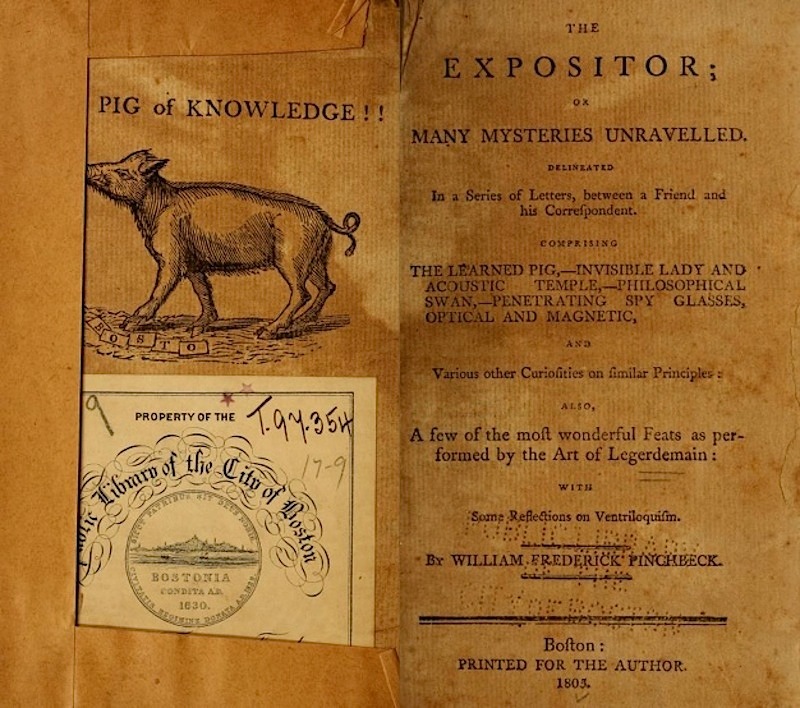 Pinchbeck, who traveled the United States in the early nineteenth century with a learned pig of his own -- counting among his customers Thomas Jefferson, who paid a shilling for the privilege -- included his training instructions in a book, The Expositor, or Many Mysteries Unravelled, in which he "spilled the beans," as it were, on a variety of acts and stage magic routines, the Pig first among them. Take a Pig, seven or eight weeks old, let him have free access to the interior part of your house,until he shall become in some measure domesticated. When familiar, you may enter upon his instruction: Take him to anapartment for the purpose of teaching, sequestered from any interruption, and three times a day instruct him as follows: Put a card into his mouth, and hold it shut, giving him to understand he is not to drop it until you please to take it from him. At first, he will throw it from his mouth every moment, which you must immediately pick up and replace, reprimanding him in a loud tone of voice. In a short time, he will understand when you are displeased, and consequently will hold the same patiently. You must give him a small piece of white bread, or a piece of an apple, &c. whatever he is most fond of. Be very observing not to suffer any person to feed him but yourself. If you have taught him to hold the card, as described in my last, you may lay it on the floor, with one corner bent upwards; then forcing his head down to the card, put it in his mouth, and hold it up with the card, not suffering him to drop it; and so repeatedly. Do not forget to encourage him for his good performances; and when he will pick the card off the floor without your assistance he is master of the second Lesson. You must now lay down three cards. He will naturally try to take the one the most convenient for him; and your business is to check him, not snuffing your nose; and, taking it from him in an angry tone of voice, replace the same, and force him to take the one next to him, or the third, snuffing your nose. By persevering in this manner a few days, he will soon understand he must not take hold, until you give him the signal, which is breathing from your nose. When you have learnt him this, you may continue increasing the cards;and that animal, who in his rude state appears the most stupid, with the least share of tractability amongst all other quadrupeds, will be found sapient, docile, and gentle. The Pig is completed! I have already exhibited him to anumber of persons, men of ingenuity and talents, in whose judgment I can confide : They are astonished beyond description. None can account for the knowledge he apparently possesses, or discover the secret communication betwixt myself and the Pig. In fact, amongst the learned, I am thought a man of talents, whilst others less informed accuse me of the Black Art, and condemn me as a wizard. Shall I remonstrate with bigots ? Shall I patiently sit down, and earnestly detail to them the cause ? They would not believe me. No: I leave them to the enjoyment of their different reflections, and for my security and reward look to men of knowledge, whose approbation is more congenial to my feelings than the unbounded éclat of a barren multitude. The mock indignation of the correspondent is delightful, and he seems even to have succeeded faster and better than his teacher! The "learned pig" act, whether based on this method or some other, seems to have continued unabated in popularity, with Mr. Pinchbeck having the credit -- if that is the right word for it -- of introducing it to the newly independent American colonies. I wonder if this is how Mr.Bean trained Freddy, well known in the animal world as an intelligent sleuth.